The City of Winnipeg's Urban Forestry Branch is collaborating with The University of Winnipeg's Centre for Forest Interdisciplinary Research on a Dutch elm disease (DED) research project to identify and prioritize the early removal of brood trees. These brood trees represent the small percentage of diseased elm trees that host the majority of elm bark beetle brood. The goal is to develop a simple, cost efficient and quick sampling technique to help prioritize trees for rapid removal. The pilot project will also assess the effectiveness of this approach. Previous research conducted at the University of Manitoba revealed new information about the activities and life cycle of the native elm bark beetle in Manitoba. In summer, the female elm bark beetle uses diseased and unhealthy elms to produce a new generation of beetles, or brood, that emerge from these trees in late summer. These beetles carry the disease-causing fungus on their bodies. In fall, they burrow into the lower trunks and root flares of healthy elm trees to overwinter under the bark. When the beetles emerge from the trees the following spring, they still have the fungus on their bodies. As they feed in the canopies of healthy elms in spring and early summer, they transfer the fungal spores to the exposed tissue in the branches. This research also found a small percentage of diseased elm trees contained very large amounts of elm bark beetle brood. One tree was found to have over 40,000 elm bark beetles. The findings from this research lead to a five-year rapid removal study conducted by the Province of Manitoba and the University of Manitoba. The goal of the rapid removal study was to determine if early removal of diseased elms reduced the incidence of DED in Manitoba communities participating in the study. Traditionally, most diseased elm trees are removed during the fall and winter which gives the elm bark beetle the opportunity to breed in these trees in summer. In the five-year study, earlier removal of diseased elm trees by middle of August (rapid removal) was applied to half of the communities and winter removals were applied to the other half of the communities. This study revealed that with five years of a rapid removal regimen, the incidence of DED was cut by half as the beetle populations were reduced significantly over that time. The City of Winnipeg piloted a rapid removal regimen in one neighbourhood in 2010 and throughout the City in 2013 to determine the feasibility and effectiveness of such a regimen. Although the targeted number of rapid removals were successfully completed in these pilots, the project identified logistical limitations in the rapid removal of thousands of diseased trees within a short timeframe. In 2014, the University of Manitoba and The Province of Manitoba initiated a follow up study to determine a methodology to identify elms that attract such high numbers of beetles for brood development, or brood trees, in order to target these trees for rapid removal. The hypothesis is the spread of DED would be reduced by targeting the early removal of the small percentage of diseased elm trees that host the majority of the beetle brood, allowing more effective management of DED. The City of Winnipeg and The University of Winnipeg are continuing the research by piloting the project in the City of Winnipeg beginning in 2017.The goal of this current pilot project is to further develop the methodology to detect elm trees that contribute most to the spread of Dutch elm disease in Winnipeg neighbourhoods. The project will be conducted in areas of the city with a high density of urban elm trees on both public and private property including selected parts of the Wolseley, Wellington Crescent and Crescentwood neighbourhoods, and is expected to run for three years. Dr. Richard Westwood and students from the Environmental Studies and Sciences and the Biology programs at The University of Winnipeg will monitor infected trees during the summer. They will determine which trees are the best candidates for rapid removal to minimize the movement of disease carrying beetles to healthy elm trees. Brood trees will be identified by sampling for egg-laying galleries under the tree's main stem bark. Each diseased elm in the pilot area will have a section of bark removed to count the number of galleries in each sampled tree. The top twenty percent of the sampled trees with the highest number of brood galleries will be targeted for rapid removal. The City of Winnipeg Urban Forestry Branch will conduct the targeted rapid removals in August. As the $30,000 pilot project gets underway in summer 2017, the City will provide information to affected property owners about the purpose of the project, the need and criteria used for early removal of a small proportion of trees, and to gain consent for removal of sampled trees. The City of Winnipeg, Dutch Elm Disease (D.E.D.) 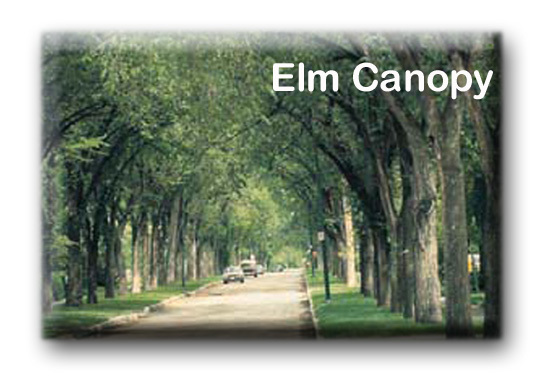 Control Program attempts to ensure the well being, longevity and enhancement of the urban elm forest within the City of Winnipeg through the delivery of effective disease control and tree maintenance services on both public and private lands. Identify all elm trees and stored elm wood locations that require further attention. Maintain a current tree inventory. Remove, or appropriately treat, all problem trees within accepted service standards. Implement ongoing preventative procedures in elm tree maintenance and insect vector control. Provide proactive tree replacement programs. Research/develop new and existing strategies through various research institutions. Provide information service through multimedia and on an individual basis. Maintain/develop partnerships to enhance D.E.D. programs/procedures. In addition to the above general program services, City of Winnipeg residents can request specific and detailed Dutch Elm Disease information from City of Winnipeg Dutch Elm Disease technicians and can also request inspections of specific elm trees of concern, at any location, to determine if trees have D.E.D. What is Dutch Elm Disease, click here to connect to our Insect Control Web Page. Can I store Elm wood for firewood? a storage permit is obtained from the director. The restriction on the storage of elm wood is necessary as the elm bark beetle uses intact wood as a site to lay eggs and develop a new generation of elm bark beetles. This brood wood results in an increase in the population of elm bark beetles, and more importantly, if the wood is infected with the DED fungus, the new generation of elm bark beetles carries that fungus on its body when it emerges from the brood wood in late summer and overwinters, and then transfer the DED fungus to healthy trees in the spring when it feeds in the canopy of elms - hence spreading the disease. The Urban Forestry Branch recommends the best ways to dispose of elm wood are by 1) chipping the wood to pieces as indicated above (wood chips can be used as mulch), or 2) taking the wood to Brady Landfill. If you know you have elm wood on your property and/or you have received a notice from the Urban Forestry Branch to dispose of the elm wood within 14 days of receipt of notice, you can burn the wood on site but you must obtain an open air burning permit obtained from the Fire Department's Fire Prevention Branch. More information on obtaining an open air burning permit can be viewed at the following link: //winnipeg.ca//fps/FirePrevention/Regulations/Open-Air_Fires.stm or you can apply for a permit at the Fire Department - Fire Prevention Branch, located at 2nd Floor, 185 King St. between the hours of 8:30am and 4:30pm. Alternatively, you can dispose of the wood by chipping as per above or taking it to Brady Landfill. If you have received a notice to dispose of the elm firewood in your yard and you are not sure which is elm - the elm logs are marked with red lumber crayon. Once you have disposed of the wood, please notify the Urban Forestry Branch as indicated on the notice so we can confirm that you are in compliance with the notice. Please note at no time is it legal to transport elm wood for any other reason than disposal at a landfill designated to receive elm wood (Brady Landfill in Winnipeg), AND at no time is it legal to store elm wood with intact bark, or that does not meet the criteria listed above as per the Forest Health Protection Act and Regulations, for burning or any other use. How do I recognize if my tree is infected? Look into the tree canopy, wilting of leaves is usually the first stage of DED, followed by yellowing then browning of the leaves. If you are unsure please call 311 for a Forestry Technician to inspect. What should I do if the tree looks unhealthy? The Urban Forestry Branch inspects all elm trees in Winnipeg for Dutch elm disease annually from mid-June to mid-September. If your elm tree looks unhealthy and you are not sure if it has DED, please call 311 - they will send a Service Request to the Urban Forestry Branch for a Technician to inspect the tree. Can I remove the infected elm tree on my property? Yes, complete removal to ground level can be done at any time. The stump should be debarked and all the wood disposed of at the Brady Landfill Site. Removals on private property done by the Urban Forestry Branch will occur at no charge to homeowner. These trees will be marked with orange flagging tape or paint. When can I prune an Elm? Does the city have a DED Inspection Program? Yes, inspections are done between mid-June and mid-September. The program also accepts and actions reports of illegal elm pruning and stored elm firewood. What steps are taken once I ask for my tree to be inspected for DED? If the tree is marked for removal (and on private property) the homeowner will receive notification in their mailbox. This notice will have an Urban Forestry contact number if they have further questions. The tree will be removed within 1 year. Note that the homeowner will be responsible for removing the stump. If the tree is not marked for removal (i.e. not DED) the homeowner will receive information on the diagnosis of the tree. These services can be accessed through the City of Winnipeg, call 311. What are elm tree injections? There is a variety of products registered for use in Canada as injection applications in the management of Dutch elm disease (DED). The City of Winnipeg currently does not use these treatments in its DED management program. As the City manages DED on a large scale, timely sanitation and elm bark beetle control are the strongest components in reducing the spread of the disease and preserving our elm canopy. Some homeowners may choose to have trees of high value treated to preserve them. The treatments are most effective when applied to healthy trees and must be repeated annually every few years, depending on the product. Injection treatments are not intended to replace sanitation practices. Some tree care companies offer these services in Winnipeg and these companies can be found in the yellow pages under "Tree Services". These treatments should be done by a professional arborist to ensure proper application. The arborist should also hold a valid Manitoba Pesticide Applicator License. In 2010, the City of Winnipeg Urban Forestry Branch began a 5-year trial with Dutch Trig®: trial with approximately 200 trees in 3 areas of the city: Wildwood, Kildonan Park, and Elm Street. The purpose of the trial was to assess the practical application of Dutch Trig® on a large scale in the city's Dutch Elm Disease management program, including its effectiveness in preventing DED and the logistics of its application on a broad scale in concert with other management practices. After three years into the trial, there were no significant differences in the incidence of DED between the Dutch Trig®-treated trees and untreated trees. Unfortunately, as our brief pilot trial was not showing a benefit to our current management program, the trial was discontinued after 2012.